What’s health or wellness coaching? It’s not a luxury…it’s a logical investment in your future. If you wonder what is health coaching, it’s an important part of your primary health care. It’s important even for those without health insurance. Because of that, it’s for those who want to heal chronic illness already in their body. You know–those lifestyle-created illnesses that are easy to ignore. Health and wellness coaching is important as a way to prevent illness. Health coaching is ideal for those who want to thrive. Do you want to practice healthy-living habits and invest in proactive wellness instead of dreading future illness? Everyone wants to avoid illness and disease. Because they do, the habits you practice at home are the key to doing that. Day-to-day habits do not need to be miserable or awkward. What is health coaching? Health coaches can help you make decisions. Such as, which habits have the greatest impact on addressing the root cause of your specific health problems. Health coaches save you time, money, and frustration. Even more importantly, coaching can help you to build goals and habits that you can stick with and even enjoy! Health and wellness coaching may not happen at your doctor’s office. Receiving coaching online is ideal for those who do not have access to a certified health coach in their own hometown. Healthy-living habits can be taught, and if you are the healthcare leader in your family, the new skills and habits you create during your coaching with Georgianne can be taught to others by you! Did you know? It takes a passion for healthy living to create a lifestyle that keeps us out of the doctor’s office! You can become a health hero in your own family. Health and wellness coaching with Georgianne involves a series of 30-minute phone calls made by appointment. In between these calls, Coach Georgianne sends you valuable worksheets, encouragement, and follow-up assignments. She becomes your friendly accountability partner. She offers you insight into tools and techniques that will help you reach your goals and feel supported all along the way. 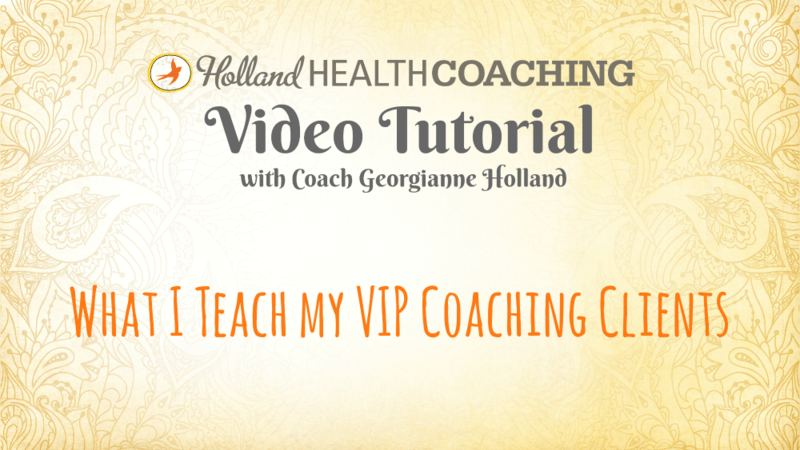 As a coaching client, you will receive access to the VIP library of coaching materials that are not made available to the public. This kind of coaching support is ideal for those whose private efforts to solve health problems haven’t yet worked out. Don’t settle for this kind of frustration! Would you love expert guidance in facing a chronic illness diagnosis like Prediabetes? Doctoring isn’t the same as Coaching…and restorative lifestyle habits are taught at Holland Health Coaching! How do I receive a coaching phone call? Like every path, the journey to your healthy body begins with the first step. I invite you to take that step by applying for a FREE Just A Taste strategy session with me today. This conversation could change your life. These strategy session phone calls with me as your coach are FREE and I look for two people to sign up every week. Will that be you? After a strategy session phone call is complete, you’ll have access to Georgianne’s Coaching Phone Call appointment book. What if I don’t have time for phone calls? There are many services offered at Holland Health Coaching that can be accessed online from home. Check out the Resources you can print out and use today! Do you want peer support and empowerment about your personal health concerns? We invite you to use email to ask Coach Georgianne your health questions. Are Health Coaches available in my hometown? An estimated 35,000 health coaches in the U.S. create personal relationships with clients to name goals, change behaviors and improve health. And their numbers are rising. According to the U.S. Department of Labor (and reported by the Wall Street Journal in early 2016), wellness professions focused on preventive health habits are set to increase by 21 percent over the next six years, faster than all other occupations. What is health coaching? The role of coaching in health care is blossoming and perhaps this trend is ideal for you. What if I feel uncomfortable with my hometown health coach? Talking to doctors can be time-consuming and difficult, and there’s even a term for those who avoid health care because they so don’t want to visit the doctor. I’m referring to White Coat Syndrome, and perhaps you feel anxious when you are with your doctor? Have you avoided health care because it makes you anxious? You might like to know that an important role for me as a health and wellness coach is to help you get MORE out of your trips to the doctor. Coaches do not replace the role of the doctor, yet they do add to their client’s ability to ask questions, understand test results, and follow-through on the self-care habits at home. Building a helpful relationship with your doctor, and helping those you love feel ready to visit the doctor, are the topics you can discuss with a coach. How should I prepare for my next doctor’s appointment? Many of my coaching clients talk about their last doctor’s appointment with me. I frequently hear about how they wish it would’ve gone better. Sometimes the problem is that they never got the answers to all the questions they wanted to ask. Doctors don’t mean to dismiss our questions. Many doctors simply run out of time during routine office appointments. My advice to you is that you prepare ahead of every appointment and bring with you a helpful worksheet that will help you AND YOUR DOCTOR focus on key questions and answers.